If mopping for you is spraying the floor and using a mop to get dirt off or using an old cotton head mop and bucket to clean with then this innovation might appeal to you. 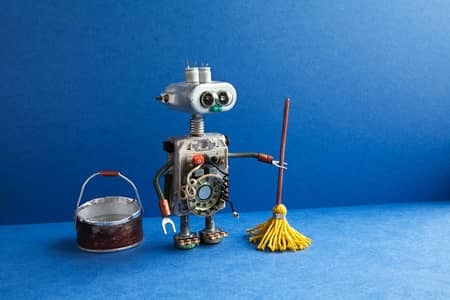 There are 2 types of mopping robot, the ones that are specifically for mopping and don’t vacuum up dirt and there are the robot vacuum and mop combinations. The mop specific robots tend to have 2 functions, dry mopping and wet mopping. The dry mopping is similar to what you would do with a swiffer mop, you have disposable wipes and the robot moves around the room picking up surface dirt. Then you have the wet mop function where the water is stored in a water tank in the robot and it wicks down onto the cleaning pad to keep it damp as it washes the floor, it also might have a spray function. I have mentioned in earlier parts of this page but what you get with these options is a choice of an attachable pad holder that can hold water which you clip underneath the vacuum and it will keep the pad damp and wash the floor as it sweeps or you can get some robot vacuums that use a water tank in place of the dust bin so you mop separately from sweeping. Again these usually have a pad holder that clips beneath the vacuum and becomes damp from the water tank wicking water onto the pad. Obviously it’s much quicker to wash the floor yourself but if you have a large area to clean which you are having to do daily and you want to be doing other things, then investing in the best mopping robot might be worth it to free up your time. Let me show you 3 different robot mops so you can see what’s available. The Braava 380t is the mopping equivalent to the Roomba vacuum. Although it is made by iRobot it isn’t a vacuum cleaner, it can dry mop and wet mop your floor. It comes with a charging cradle that you can sit it in to recharge but it doesn’t return to it by itself you have to place it in there. It does have sensors though to work out where it is cleaning, it comes with a navigation cube which you place in the room and it communicates with that to work out where it has been. has a small reservoir underneath which you attach the cloth around, this drips water via a wick onto the cloth so that it wets it as it goes along. Most people tend to wet the cloth first before they start it mopping. It also comes with a white microfibre cloth which you attach underneath and it will go over the floor and pick up any dust. You can do this first before you mop the floor or just send your Roomba in if you have one to sweep up first. There are 2 cleaning modes on this mop the Dry Mop Mode and Damp Mop Mode. You would use the dry mop mode to sweep the floor, it will start cleaning from wherever you place it in the room, working backwards and forwards in long straight lines until it has covered the whole room then it will go around the edges and finish in the same place it started. The difference with the damp mop mode is that it will move in straight lines but it has a small backwards and forward movement, just like you do when you mop, so it has a better chance of taking off dirty marks. If you find the cloth gets quite dirty you can remove it, rinse it out and replace it to finish off. Unlike most robot vacuums you can’t set this to go when you go out, you need to monitor it but you can be doing other things while it works. It’s not the cheapest at around $250 but it will save you time and effort and the cloths are washable. The Braava Jet 240 is the little brother to the 380t. Made by iRobot it’s a smaller version and so can fit in smaller spaces easier like the bathroom. You can’t program it to clean when you’re not there but you can set it away very quickly to work while you concentrate on other things. The pad holder vibrates when it’s using the damp or wet mode to gently scrub the floor. The pads have a cleaning product on them which activates with the water so you don’t need to use any cleaner. There is a water tank inside the robot mop and it sprays on the floor in front of the unit as it moves along the floor. It has sensors which allow it to avoid obstacles while it follows a linear cleaning path. at around $170 but it will do the job so you don’t have to. is also a robot mop. It a longer mop which has 2 circular microfibre cloths underneath with a water reservoir for cleaning. This is probably a more powerful mopper and would be much more efficient in large areas because it goes around in a circular motion a bit like a floor polisher all around the floor. It is a more random clean and because it is quite large can bump into furniture and not fit underneath. can run for around 50 minutes which gives it a good long cleaning time although it is quite loud when it’s running it can give a deep clean. There is a handle in the unit so you can easily carry it or use it to clean walls or tables. It retails at under $300 so not cheap but very useful if you need to clean large areas. If you’re looking for your own robotic assistant to help with your floor mopping then check out these mopping robots to see if they will work well for you.